SKN Renew is an anti-aging cream which provides your skin with two main active ingredients, collagen and retinol. Collagen is already found in our skin, but with age it starts to disappear. SKN replaces this lost collagen. The manufacturer claims that this product will make your skin smooth, soft, and devoid of most of the signs of aging like wrinkles and unsightly lines. It will also hydrate your skin so it’s properly moisturized. Who is the Manufacturer of SKN Renew? The product manufacturer is SKN Renew, which is a newly opened company. 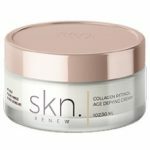 SKN Renew is a skin care company that is dedicated to producing creams that help combat the effects of age on the skin. Their products use specific targeted ingredients to combat wrinkles and lines on the skin, rather than a lengthy list of substances included in the product. They only sell their products online. The company’s creams are not distributed to any retail outlets. How Does SKN Renew Work? SKN Renew contains two primary ingredients: collagen and retinol. Collagen is a substance that exists naturally in our skin and is responsible for the elasticity and aging of our skin. Over the years, the amount of collagen we have diminishes and that leads to wrinkles and other signs of age. SKN Renew replaces the collagen in your skin and removes those signs of aging. The second primary active ingredient in this product is retinol. Retinol has been proven to both prevent and remove the visible signs of aging. SKN Renew Ingredients – Are they Safe & Effective? There are only two primary active ingredients in SKN Renew cream – collagen and retinol. Collagen is the primary structural protein that can be found in our bodies, and it is spread throughout the entire body. The main function of collagen is to get rid of dead skin cells and to provide the skin with elasticity. With increasing age, the collagen in our bodies begins to dissipate and that can lead to signs of age on the skin. The collagen in SKN Renew is meant to replace that missing collagen and restore the elasticity and smoothness to your skin, as well us diminish wrinkles and lines and prevent them from reoccurring. Retinol is a yellow colored substance which occurs naturally in some foods, such as egg yolk, fish-liver oil, and green and yellow vegetables. A large body of research has discovered a strong link between this substance and anti-aging. A 2007 study by Kafi, et al confirmed this connection and showed a reduction in wrinkles in people who used retinol on their skin. What are the Advantages of SKN Renew? SKN Renew cream leaves skin smooth and moisturized. Can remove dark circles and discoloration. It is designed to eliminate crow’s feet. It helps to nourish and repair the skin. What are the Disadvantages of SKN Renew? Can only be purchased on official website. How Should You Take SKN Renew? You should use this product twice a day: in the morning and in the evening. Take a small amount of the cream into your hand and spread it all over your face and neck. Remember that this product does not contain any sunblock, so if there is a lot of sun outside you should use some as well. How Much Does SKN Renew Cost? The cost of the product is not clearly provided anywhere on their website. They do mention that they have some deals available, and that the lowest price you can get if you buy the cream in bulk is $28.57. What is SKN Renew’s Return Policy? The company doesn’t list a return policy anywhere on their website; not even in the Terms and Conditions. So it’s extremely unclear what you would do if you were unsatisfied with the product. There is no contact information on the site for the company or for a customer service department. Does SKN Renew Offer a Free Trial? No, the company isn’t offering a free trial for this product. There is no mention of a free month or free samples dispersed by the company, so the consumer can test out the product before they make a final decision to purchase it. Certainly, offering at least a free sample would do a lot to entice customers to try out the product. SKN Renew is an anti-aging cream which is purported to prevent and diminish age lines and wrinkles on the skin, moisturize the skin by providing it with hydration, and return it to a smooth, youthful looking state. For the most part, customers were pleased with the results of this product. The key ingredients, collagen and retinol, do seem to do their job in returning the skin to a youthful state. Customers said it did get rid of the wrinkles and lines on their faces. Although the key ingredients in this product are very effective, there are a lot of popular anti-aging ingredients which are missing from SKN Renew and which could have been included. In addition, there is missing information on the website such as the price of the product and the company’s return policy. Before you decide to purchase this product, it’s very important that you research the cream and its ingredients very carefully. You need to make sure you aren’t intolerant to any of the ingredients. It’s crucial to research any product you purchase so that you know what it’s made up of.